That’s right, I hit 31 today (7th April) and we honestly had a fantastic weekend (re: Tabletop Day on Saturday and out for dinner on Sunday night). The only downside is our Alhambra Big Box didn’t arrive today but should be here tomorrow! Anyway, that aside, quick update: It has been a busy year. I’ve probably said that somewhere once before, here or on my G+ page, but I’ll say it again. Busy year, even just mentally. I’ve had my hand in a few playtesting projects, sometimes all at the same time, and that threw my free brain time out the window. Hence, now I am breathing a breath of fresh air as I have nothing on my plate at present. Never again will I do concurrent projects! Two of those playtested projects I can mention but that is all I can do as Fantasy Flight Games have announced them (The Last Banquet and Eldritch Horror’s expansion: Forbidden Lore). Anything else though is under wraps, for now, due to NDA. I have a huge review I am working on slowly and finding it is more of a handful than I anticipated. I’ll be putting up, eventually, a review for Final Fantasy 14: A Realm Reborn, the re-released MMO from Square Enix. I’ve never reviewed a MMO before as I normally think “What is the point?” when they are ever changing. FFXIV is different. Since their re-release in August 2013, the game has only been getting better and better with each major patch (2 in 6 months). I started doing the review and realised it will be HUGE unless I rein it in. That is where I am at at present: getting it slowly organised into the “What makes FFXIV better than the rest?”. For a simple reaction from us: It has made us not look at any other game as there is always something to do, and that isn’t including end game (re: raid) content. Either way, with that out of the way, I also after the weekend have got back into board gaming a bit more as the son is itching for more and more Sentinels of the Multiverse. Both the wife and I agree that it is our most favourite card game (ever!) and hence we will be working on our own box design to safely hold all the cards (base game + 3 expansions) and whatever else comes. The expanded edition box does hold all the cards but it really is a “Wafer thin’ situation. After this busy first quarter, I am hoping of some more posts here or at least socialising on the G+ page I have now while working out what else I will be doing this year in the Shiny realm. I hope you all have a good easter, whether you celebrate it or not, as to me: all that matters is bringing the family together! 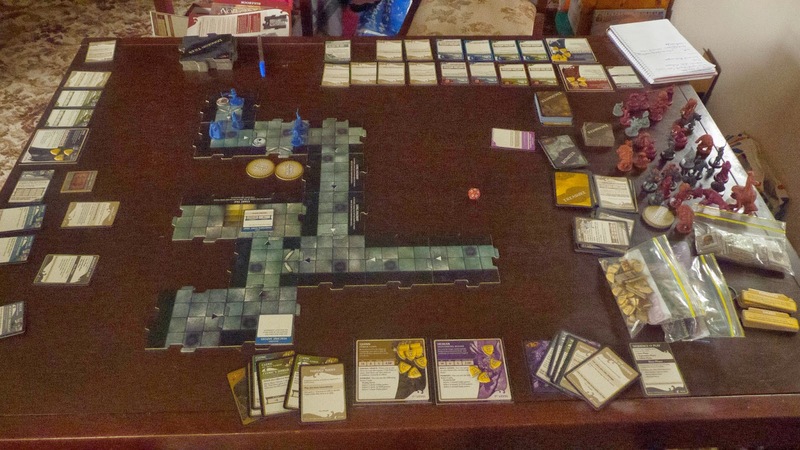 Our International Tabletop Day 2014! Next year, I will organise an event at the local library here as I didn't think of it for this year. I'll do up the page over at www.tabletopday.com with all the details and I'll publicise it for next year. It'll be good to get our board game group together (once in a blue moon at present) and to show others what we do. We wanted to do a club but never worked out, this instead is once a year and easily organised. 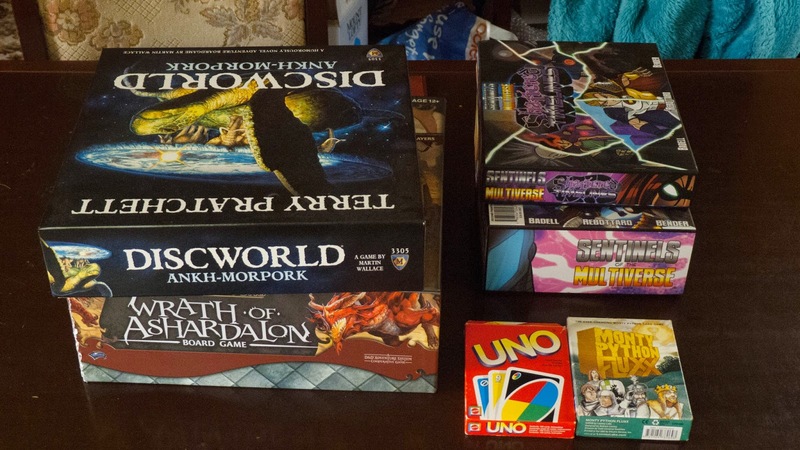 Now you ask, "What the heck is Tabletop Day? Is that like.. Monopoly?" Yes, this was what I was asked when I had my blood test Saturday morning >.> My answer: "Not just Monopoly but more complicated ones, card games and other board games." It was hard to describe to someone who thought of Monopoly and Mouse Trap when thinking on board games. Now, back to what I was saying, what is Tabletop Day? Our group wasn't extravagant but it was still a lot of fun with my wife, son and myself playing from around midday till 9:30pm (with a break for shopping) when the official part ended (wife/son played a few more Fluxx games afterwards). We used elimination rules we learnt via the XBLA Uno game as it is nice and quick! We opted to play all the classes rather than just three because it really was a hard choice on who to take in with us. The adventure went really smooth, to be honest. I believe it would have gone pear-shaped if we had split up and kept spawning new rooms. We did branch off (see path above that goes to the right) but doubled back to the path that was heading north on the picture to eventually lead to the Vault. Special mention has to go to Aramis' Rogue who managed to wipe out all 4 monsters on 1 tile with one attack! It made our life easier with that, that is for sure! I had a good lead in this game actually with the Merchant Orcs raking the gold in but by the end, I was beaten by Tmara by a good 20 or so gold. Her total was 103, with myself around 80 and Aramis was around 60. This is one of my top favourite co-operative games (and our only Super Hero game, I believe) because of how much it really, REALLY has the deciding factor on how well the players work together (as well as who the heroes are, sometimes). So far with Sentinels of the Multiverse, we have the first 3 expansions of Rook City, Infernal Relics and Shattered Timelines and eventually, we will have the rest of them when they all come out..
We honestly looked like it was going to be left as Tmara vs the Boss for half the game there as the infection the Plague Rat kept taking both Aramis and myself down. Ultimately, Aramis made a huge sacrifice to take one for the team and then his Incapacitated Powers kicked in and oh my gosh, did that become the deciding factor for the heroes to succeed! Each of Aramis' turns, he kept giving Tmara or myself the ability to play a card or do a power. Even before his demise too, I was finding it tricky with bringing out more Mechanical Golems as Unity but both Aramis and Tmara gave up equipment for the greater good (even used a ring to make a small Raptor Golem!). Both Tmara and myself kept ourselves upright to see the Plague Rat fall and be locked up in The Block for one more day but we couldn't have done it without Chrono Ranger sacrificing himself. 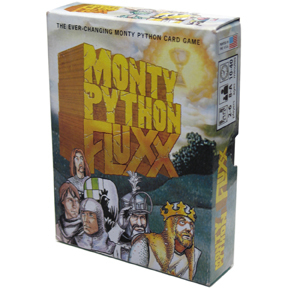 This one is harder for me to summarise because if you have ever played a Fluxx (we only own Monty Python, at present), it is a cluster---- and hence cannot state what happened unless you were there! This is Tmara's favourite in our collection because not only is it Discworld (re: Terry Pratchet Universe) but it is perfectly executed both with art style and the mechanics. It is a worker placement game where you have a limited number of workers to place on the board while playing cards each turn and ultimately trying to get your individual victory condition. All while this happens, while you are trying to win, you are trying to do so in a way that doesn't tip off the other players on who you are playing! In our game, Tmara's Lord Vetinari was trying to get a certain number of minions onto the board to win. I (Dragon King of Arms) was trying to cause as much trouble (the round black markers) and when there was 8 on the board at the start of my turn, I won. Aramis, alternatively, was Commander Vimes and his only victory condition was the draw deck had to run out (ie that Vimes held the city together, through thick and thin). Tmara was 1 minion away from her victory when I myself just smuggly said "I win" much to their bewilderment. Aramis may have lost but he definitely slowed my trouble placement down as well as assassinating Tmara's minions. The other Personalities you can play is 3 of them are controlling a set amount of areas on the board (Lord Selachii, Lord Rust, Lord de Worde) or having a certain net worth of money and buildings (Chrysoprase). 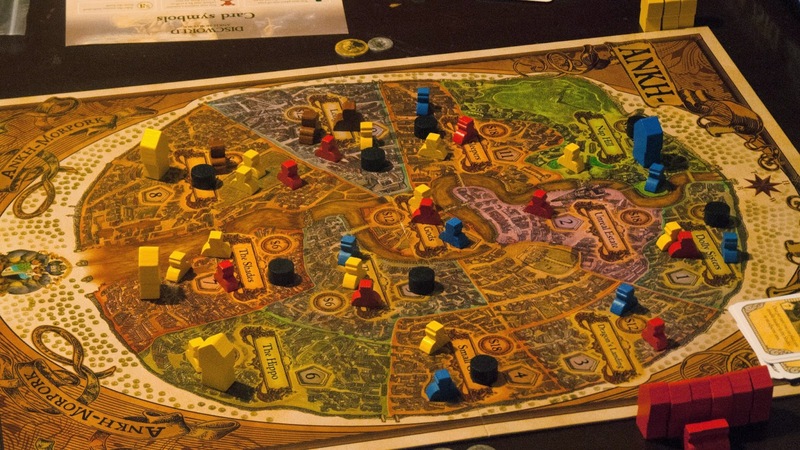 If you are a Discworld fan, we highly recommend this game as it drips Discworld both in the art work and the mechanics on each card from anything like CMOT Dibbler to the Seamstresses Guild. We love the Elimination rules that we first learnt via XBLA's Uno game. The rules are simple: If you can't play a card, you are out. We had tokens on the table and the first player with three was the winner. Overall Champion for 2014 goes to Aramis! It was a fun game last night! My X-Wing buddy and I decided it was time to finally play against each other again. Now, I've only played maybe 4 games vs his 100+ or something now, so it was going to be fun either way. We decided the gloves were off and to play any faction, we ended up with Rebel vs Rebel. 1x B-Wing with engine upgrade and don't think it had anything else? Either way. that aside, it was a LOT of fun. We played with a slightly bigger field (3x5) and with asteroids, as we always do. It was amusing because out of my three ships, I didn't anticipate the HWK (Kyle) to be the one that actually be the last one standing for my squadron. Anyway, that aside, progression pictures below. As you can tell from the pictures, it was a good game but slowly deteriorated. I honestly had a LOT of fun with squadron and would love to tweak it and try it again in other plays. The game honestly at the end there was John saying "This will be over in a few turns" and a few turns went by and he hadn't actually gotten to take a shot at the HWK or if he had, the asteroid gave me enough cover to slow the death. I actually was believing I had a chance against 2 B-Wings because I had the asteroids and I had a turret. That was where it all went wrong: Ten Numb did a critical and it came up with blowing up the secondary weapon: the turret. So in that last picture, you can imagine that no turret = dead. It was damn fun though :D Looking forward to getting my first Y-Wing this week and at some point a TIE Bomber/Lambda (I want the Lambda more) as the announcement of Wave 4 (Squeeee! Memories of TIE Fighter on PC there!) has made me want to catch up on the missing models so it won't be so painful later. That's right, this year was meant to be a cheaper year when it came to gaming but then I was bitten by Fantasy Flight Games Star Wars Edge of the Empire tabletop roleplay game. We are definitely a Star Wars household and the step son is at that age that he would actually be able to roleplay just fine, with some guidance, and so the fun began. We got the Core Book plus dice and I've had a decent read through of it and because I own the Warhammer Fantasy 3rd Edition that FFG also made, I already knew partly of what I was getting into. Infact, Edge of the Empire and hence the future books are going to be much better, more streamlined and plain out more Star Wars. But yes, it didn't end there.. after the Core Book and the dice, I have an order on now for the Beginner's Box, GM's Kit as well as the first adventure module Beyond the Rim. At first, my wife and I were against the Beginner's Box since we've roleplayed before, why do we need a product catering new players by doing a linear adventure? Well, it comes with stuff. An extra set of dice as I've heard 2-3 sets are good, a full double sided map as well as some premade players (re: future NPCs) as well as tokens. As for the adventure, I am really looking forward to it. The way it has been designed is that each game can/will be unique when you take into the dice mechanic the game utilizes. I've read a few threads where two games are different because of things that occurred. I'm liking that factor where most modules are 99% linear between different play groups unless modified. Anyway, that all aside, I'm looking forward to the books that are coming or have come but I've not got my hands on them yet (Explorer & Hired Gun books) and I'm definitely going to be wanting the whole collection while FFG has the licence! I missed our on West End Games D6 system with Star Wars and by damned, I will not miss out on this. Tabletop Buys - Oh the horrors of clearances! Expensive week, yes we have had, hmm. The purchases were done a day before the car broke down too! Oh well, these things happen but gaming prevails. - repacked booster of minis from any set. The minis I planned on more as they are selling 12 booster packs of some sets for $50 each. With the car breaking down though, this will be on backburner. I'll post pictures on the items when they arrive!